In 2018, the Spirit partnered with the Strikers and the Richmond Kickers to host a preseason game between Washington and the North Carolina Courage, which drew 6,235 fans. The 2019 edition comes on the heels of the U.S. Women’s National Team competing in the SheBelieves Cup, in preparation for the 2019 FIFA Women’s World Cup. The Spirit’s U.S. Women’s National Team members Rose Lavelle, Mallory Pugh and Andi Sullivan are all scheduled to appear in the game in Richmond. 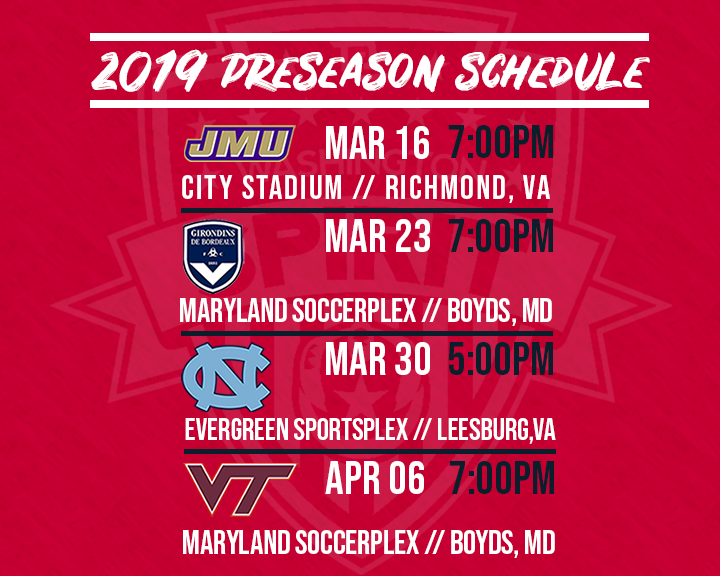 On Saturday, March 23, the Spirit will host French club Girondins de Bordeaux for the club’s 2019 debut at the Maryland SoccerPlex. Bordeaux competes in Division 1 Féminine, the highest division of women’s football in France. The following Saturday, March 30 will mark the Spirit’s return to Evergreen Sportsplex in Leesburg, Va. to host the 22-time NCAA champion North Carolina Tar Heels. This will be the third year in a row that Washington has hosted a preseason game at Evergreen SportsPlex, with both previous occasions featuring sold-out crowds of 2,000 fans at the Northern Virginia park. In the club’s preseason finale on Saturday, April 6, Washington will host Virginia Tech at the Maryland SoccerPlex. It will be the second all-time meeting between the Spirit and Hokies, and the first since 2015.